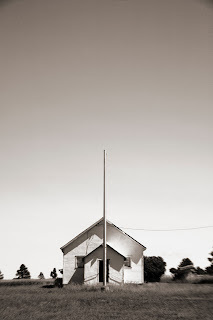 I was heading toward Devils Tower in eastern Wyoming when I chanced upon this beauty of a one room school house in the middle of the plains. The little edifice was all prairie geometry and plaster with a flag pole that pierced the forever sky. At the moment that I set up to take the shot something went kaflooey, that's the technical term, with my go to lens, the inimitable 28-135. The whirring death throes of its little motor caused unruly flare, foreground blur and a general softness that were downright aesthetic, one of the many happy accidents in a long photographic life. Sorry for your loss (the beloved 18-135MM lens), but what a wonderful composition your now departed friend left as a legacy to your photographic talents. Love the photo of the one-room institution of basic learning. Thanks Jim. Fortunately Canon fixed the little gem and it had been 100% ever since. I think that was 2010. I must have had that lens for over 20 years. Your description has such a flourish here. "The whirling death throes of its little motor" is a thing of beauty, even though it caused "unruly flare". The image is a stunning accident. Would that all photographers experience that. You were too kind to mention that I used that images less than a year ago, marking the first time in seven years that I've knowingly done so. Thanks for ignoring it. Happy New Year.